Autofed and manually pegged drawings must register against each other if you intend to use both scanning methods. Therefore, you must calibrate the scanner so that it can register the peg holes accurately using the peg bar. 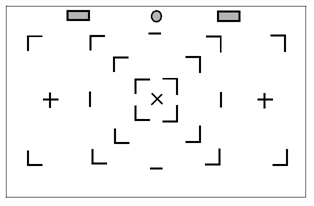 A drawing with field size and peg hole locations identical to the type you intend to scan. Instead of using a drawing of a character or object, you may find it helpful to create a test "drawing" by placing a sheet of drawing paper over a field chart and tracing several heavy line segments from the field chart. For more accurate calibration, draw lines from the centre to the edges of the paper. This will give more reference points at various locations on the paper. For example, trace over the centre X and several corners of the fields from the centre out towards the edges of the field chart. Then peg and autofeed the test drawing as described in the following procedure. Create a small scene in Harmony using the test drawing. Using Control Center, create a job that has one scene. Using Harmony, create an exposure sheet for the job that has two drawing columns (one for the drawing you will autofeed and one for the drawing you will manually peg before scanning). Open the Scan application and open the elements you created. Perform an Autofeed scan of the test drawing in the autofeed element, with Optical Registration enabled. After the drawing has vectorized, load it in Stage by reopening the scene. Loosely tape the peg bar to the scanner bed (centre the bar horizontally on the scanner bed; move the bar vertically on the top of the scanner bed). Scan the pegged drawing with the Autofeed feature off. After the drawings has vectorized, load it in Harmony by reopening the scene, and comparing its alignment with the drawing scanned in step 4. If the two images do not align, move the peg bar and rescan the pegged drawing again. Repeat these steps until you have aligned the drawings. When the peg bar is in the desired position, securely attach the peg bar to the scanner bed. Keep the test drawing for future use.